We are two months out from Pico de Orizaba, so it’s time for…the 20 mile hike on the West Orange Trail! Themes of the day were butterflies, bugs, and bruises. 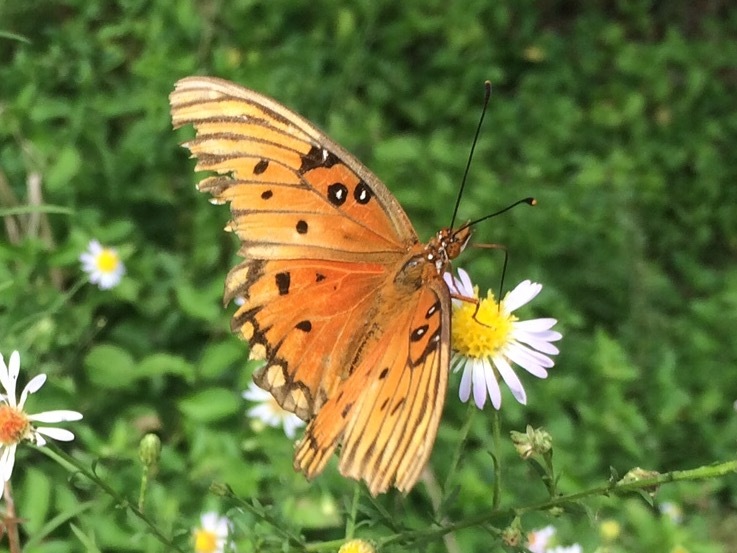 The butterflies you’ll see in the photos below. The bugs are not pictured, but it turns out that every beautifully shaded bench is equally viewed as such by Florida’s massive mosquitos. And the bruises are from the last two miles where I decided my boots were laced too loosely, tied them up tightly – and hugely over compensated. It’s 6:55 a.m. We violated all of our vows to prepare sensibly by not going to sleep early enough. Instead we followed dinner with our friends M and S (see “travel with friends – the Iceland series” https://fromswamptosummit.com/2015/03/15/iceland-part-1-a-day-in-reykjavik/) with a visit to an Irish pub, Fiddlers Green, to hear The Windbreakers. We’ve been listening to this Irish music duo since all of our kids were knee high to a grasshopper. But it wasn’t conducive to an early morning rising. Nonetheless, by 8:15 or so we contacted Uber to take us up to the trailhead. It was way too early to get any of our nearest and dearest to drive 30 minutes on a Saturday morning. I’m sure I typed in the right address on the Uber app – to Park Avenue in Apopka – but somehow our driver thought he’d picked up a trip to Park Avenue in Hollywood, Florida. Now that would have been a worthy affair. 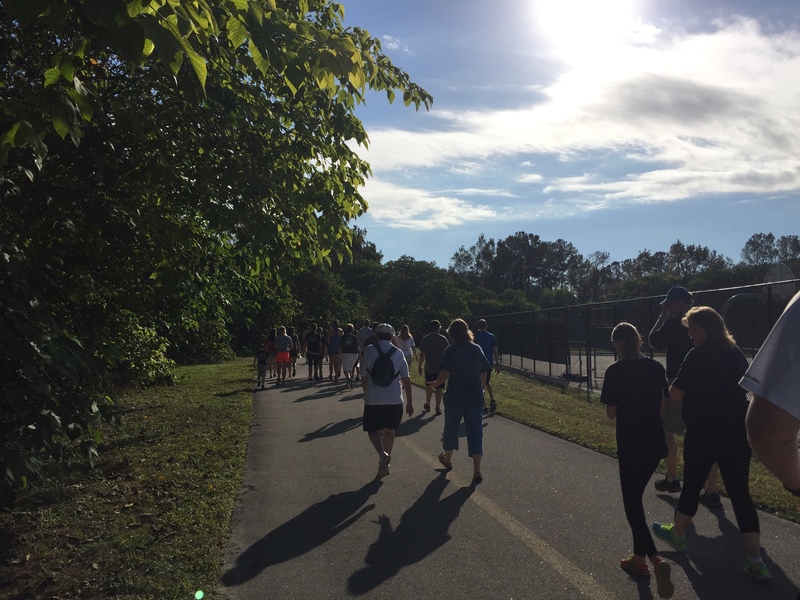 Mile 2 – after exiting our Uber ride (surely no more stylish way to arrive), by the Apopka Middle School, we suddenly found ourselves in a throng of a couple hundred middle school students, some with parents, walking a walk to raise money for either breast cancer or cystic fibrosis. Whatever the worthy cause, I’m embarrassed to say we walked as fast as possible to get ourselves out of the throng. Here are the snippets from my contemporaneously recorded notes. Scraps of middle school conversation. “She blew up in the middle of class” (I really wanted to know how that happened). Very few boyfriend/girlfriends hand holding. I’m sure there was more of that in my day in the ’70s. Downtown Apopka. The Catfish Place restaurant amidst a sea of fast food establishments. Dunkin Donuts taken to an art form. Right next to the BBQ place. Turns out BBQ was a theme for the day. Mile 3. Shaded woods, winding trail, lots of churches. As before, I’m baffled by St. Elizabeth, Church of God by Faith next to the Freedom Missionary church. More BBQ smokers smoking away by modest and well kept homes. Moving on – we pass what must be a borrow pit for the interstate construction project. Mile 4. Two people pass us, riding what look like elliptical bikes. Never seen them before. All of a sudden I realize my iPhone email isn’t working and it wipes out and then re-downloads my messages since August. Not a big deal – except I’m already fielding work calls on this Saturday morning. 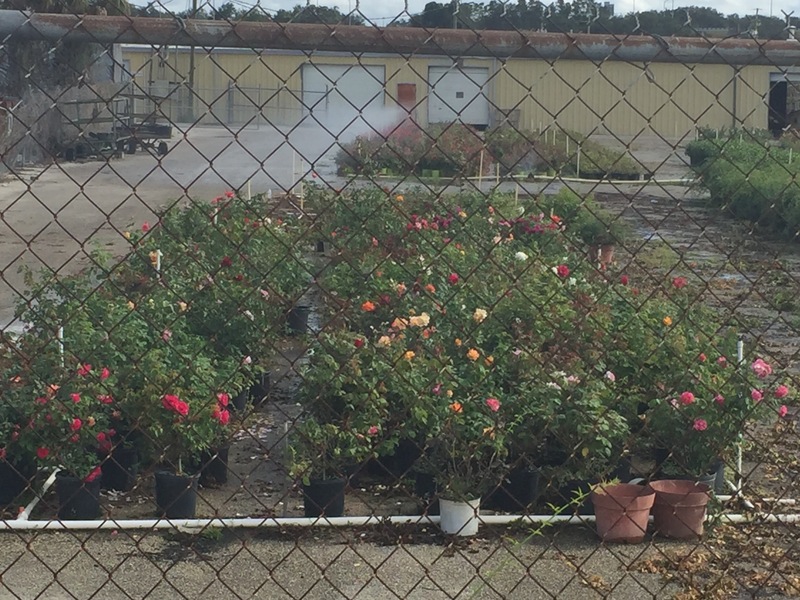 The remnants of Florida’s fern industry – right next to Nelson’s Florida roses and Hippy’s Junk Auto Parts. That’s really the name. At Mile 5 we take a break – where we encounter the first of the mosquito swarms. I also inadvertently hit my Fitbit watch face and it starts counting miles all over again on the GPS. For the remainder of the hike, I’m adding 5.23 miles to what the current mileage shows. That’s a challenge to your math after about six hours or so. Mile 6. We’ve made our way to the Buddhist temple,which was such a surprise the first time around. A service is going on. I could hear voices but couldn’t make out any words. Through the open door at the back I could see the monks in their yellow robes. 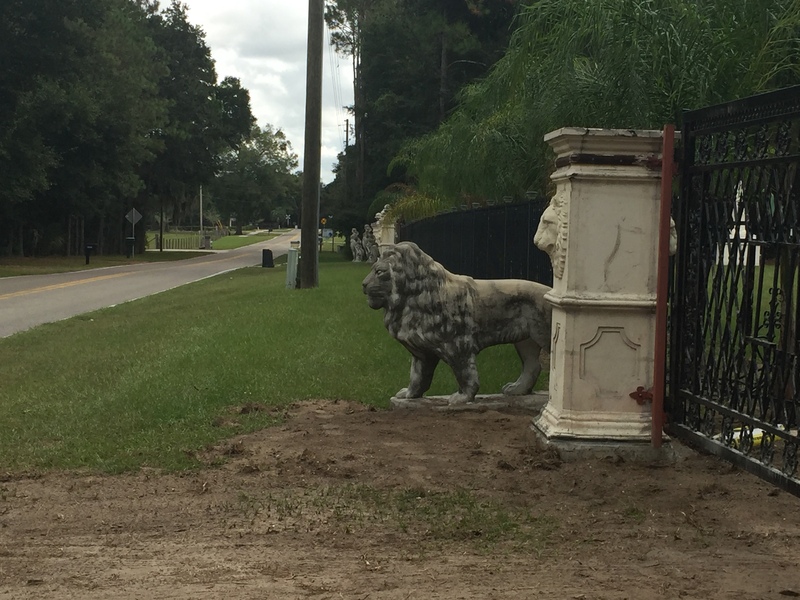 Immediately after we pass a home decorated with great concrete statues – next to one of several town homes abutting the trail where birthday celebrations seemed to have started hard and early. “Go Jerry” – whoever you are. Mile 7. We’re back on a sidewalk by a main road. Housing complex to our left, clear cutting and a seemingly abandoned housing development on our right. It’s really hot. We’ll see a long stretch of unshaded asphalt ahead of us and just think – go for it. Mile 8. Off the streets again onto a trail. But it’s a stereotypical Florida image. A golf course on the left, a memorial garden on the right, and a filled in swimming pool by some outbuildings. Golf, then die? Mile 9. We stop for lunch under an overpass. There are golf courses on either side, but there are no bugs because there are no trees. And we forgot the bug spray anyway. All of a sudden, we realize what we had thought were some sort of exotic trash cans are really water coolers. Who knew. Mile 10. 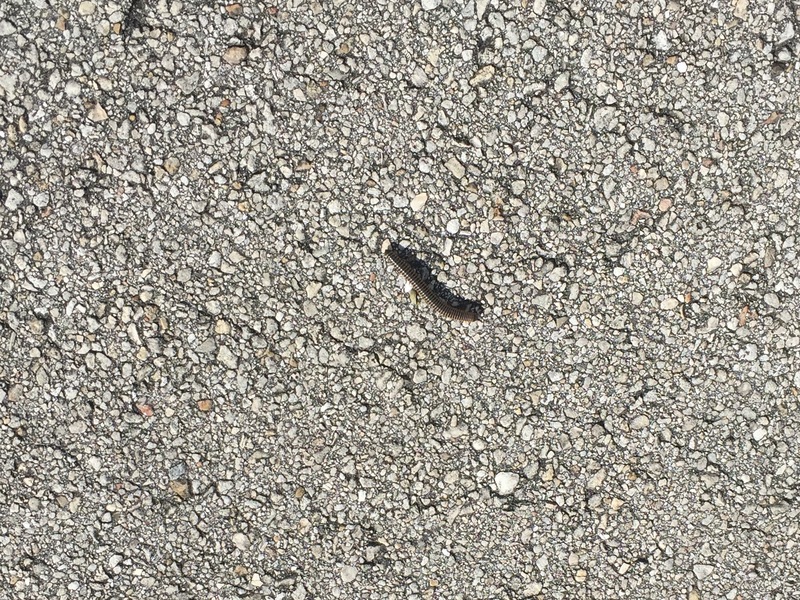 Tiger swallowtail butterflies; beautiful light brown and lavender moths, Florida’s version of monarchs.. Caterpillars. I spend a lot of time thinking about shape shifters. Mile 11. Time for blister and foot repair. Get a call from daughter #2. She sounds good. Way away from golf courses now and back into that odd cacophony of semi rural and suburbs. There’s an old warehouse on the right, and a band practicing. Mile 12. 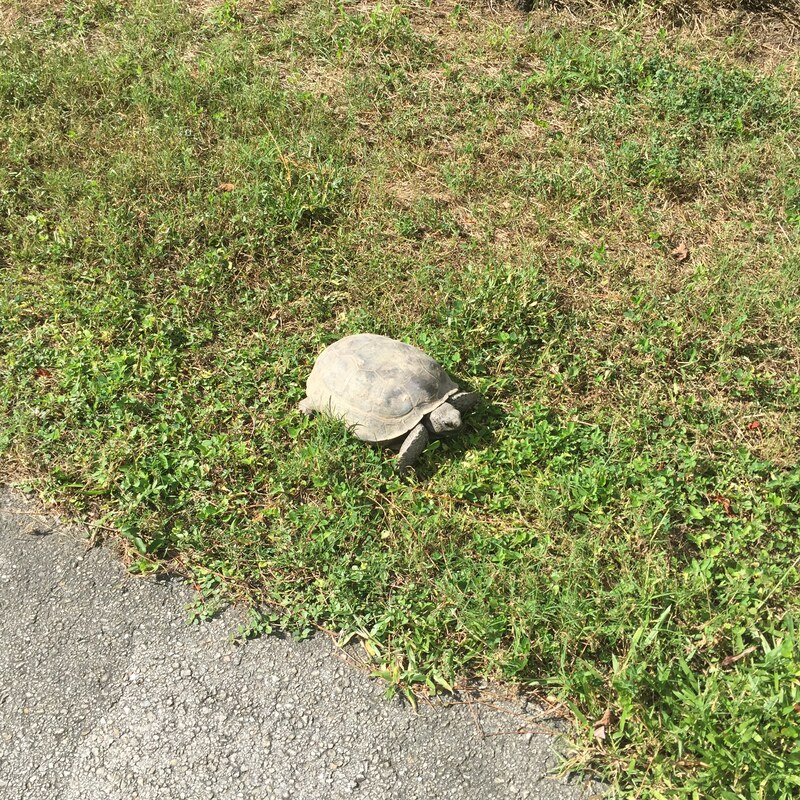 We see a huge tortoise. We pass Ocoee High School. There’s an ag program, and the three cows and donkey make lot of noises as we pass. Reach another rest stop – the “Chapin station.” Lots more housing developments. A bathroom break. I see a flame bush over the top of the white vinyl fence lining the trail. Mile 13. I’m getting tired. After some beautiful wooded and agricultural sections, we pass a truck storage spot. Guys are hanging out by their big flatbeds. A smoker is going. Looks like a good time on a Saturday afternoon if you have to hang out by your work truck. There are old abandoned orange groves and a few packing buildings. There’s a concrete plant. Seven more miles to go and my discipline of a sentence or two each mile breaks down. 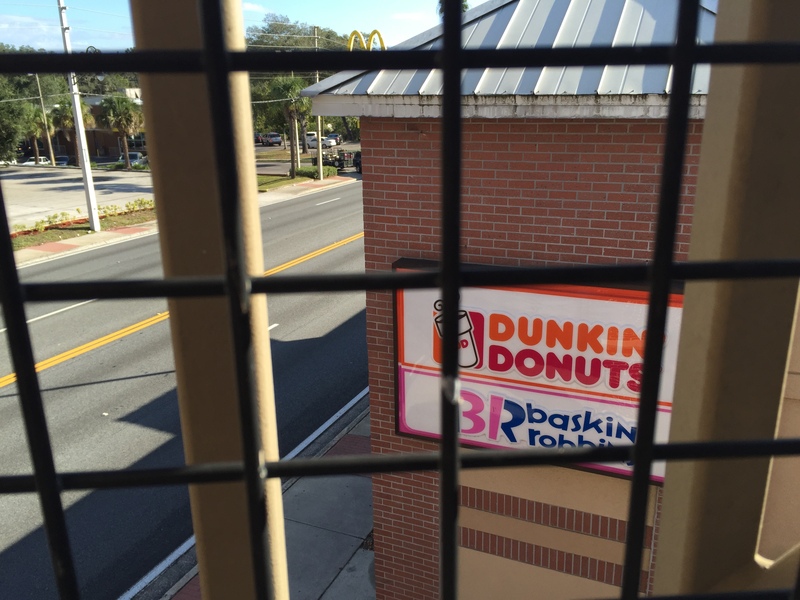 Here’s what we saw – in retrospect – moving into Winter Garden. An absolutely perfect small town restoration, with a lively downtown and lots of people, enjoying a November Saturday. The last five miles are a park-like trail from Winter Garden to the Killarney Station with oh so eco friendly housing developments – but they are still housing developments. The odd farm opposite on the other side of the trail houses zebras and ostriches. There’s a parking lot for mega party buses. And a covered bridge going over the interstate that we were sure was swaying beneath our feet. Or that could just have been the fact it was mile 19. Nothing beats Florida for iconoclasm. Suburbs. Spanish moss. Greenness that just doesn’t quit. Even the golf courses can’t eradicate it. And peering down at it all this great blue flat sky. 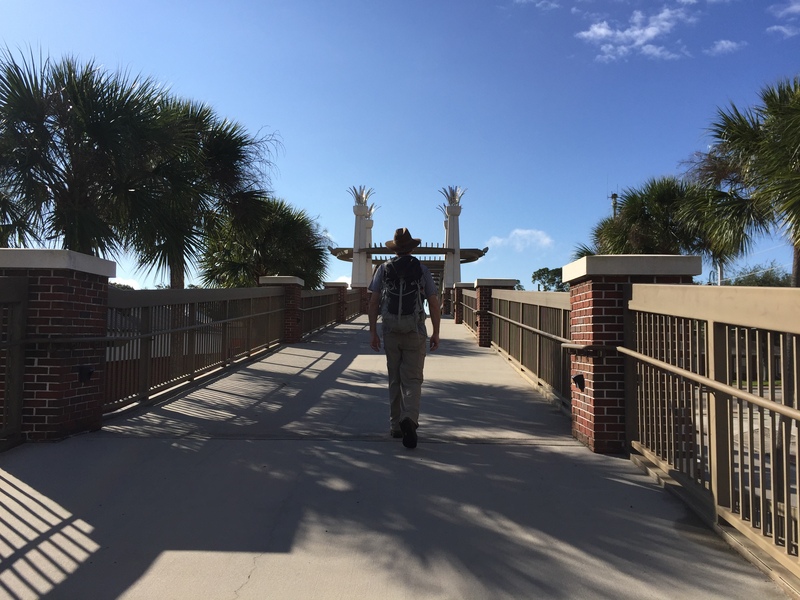 After we reached Killarney Station and met up with friends A and T – and enjoyed beer and pizza at Winter Garden’s Crooked Can craft brewery (the thought of an ice cold beer definitely helped motivate those last five miles) – we wended our way back to College Park. But on the way we passed by the Citrus Bowl where the Electronic Daisy electronic dance music festival, replete with ferris wheels, carnival rides and neon sound, was going on. Even in my house late at night, some miles away, I could hear the bass. It wasn’t iconoclastic, somehow. It was just another way of finding the same sort of engagement I felt out there on the trail. It’s Florida. Life is really made up of the details!